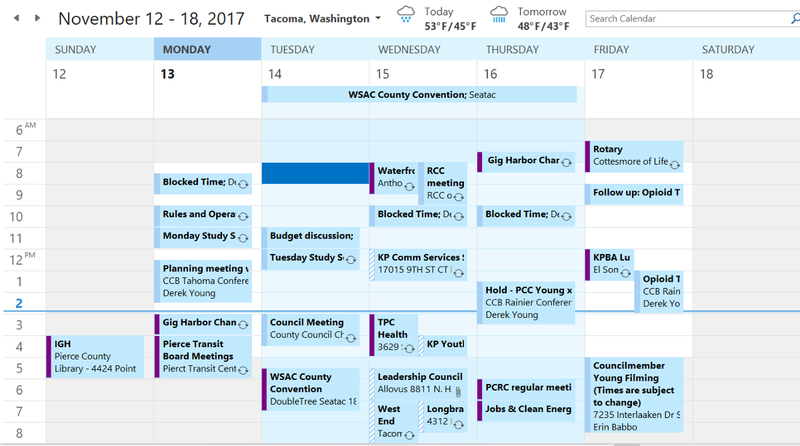 Schedule note, I have a Legislative Steering Committee meeting for the Washington State Association of Counties at the same time as this meeting. If a quorum is available, I will head to that meeting and won’t be at this Council meeting. Proposal №2017–61s, Implementing the 2018 Budget — Amending Code An Ordinance of the Pierce County Council Implementing the 2018 Budget; Amending the Pierce County Code and the Powers, Duties or Responsibilities of Certain Pierce County Departments, Boards, or Commissions; Amending or Repealing Certain Ordinances; and Setting an Effective Date. This bill makes code changes necessary to implement the budget. The main one being adoption of new public record rules established under a bill passed by the Legislature this session. Proposal №2017–82, Rules of Procedure for Filling Vacancies in District Court An Ordinance of the Pierce County Council Amending Section 1.28.180 of the Pierce County Code, “Procedure for Appointments to Vacant Council Positions, and Other Vacant Elected Positions,” to Update the Council’s Rules of Procedure for Filling Vacancies in Pierce County District Court. We’re about to make an appointment to the District Court and in the process, noticed some minor tweaks to our process that need to be made. Proposal No. R2017–121, 2018 Historic Preservation Grant Fund Disbursement) A Resolution of the Pierce County Council Approving the 2018 Pierce County Historic Preservation Grant Fund Disbursement as Recommended by the Pierce County Landmarks and Historic Preservation Commission. There are a number of projects in District 7 that will benefit from this year’s Historic Preservation Grant. Proposal No. R2017–128, State Legislative Priorities A Resolution of the Pierce County Council Adopting the Pierce County Washington State Legislative Priorities for 2018. Each year the Council adopts the State Legislative agenda that we will advocate for in Olympia. Some highlights for the 7th District include a funding request from the Transportation Budget to cap Narrows Bridge tolls, a Capital Budget request for the sprayground at Gateway Park. Earlier this year we got a request for my forward looking calendar. Rather than have staff waste their time on public record requests, I’m just going to start publishing screen shots. Keep in mind, my schedule isn’t static. Things will get added, deleted, changed, etc. There are conflicts that I have to pick between. But if people want to see where I’m at and who I meet with, that’s fine by me.